Teddy Vlock is no stranger to a busy schedule. As a full-time student at Yale University, co-founder of T&R Developments and an up-and-coming young rider with a busy competition schedule at the Winter Equestrian Festival, 21-year-old Vlock knows how to manage his time. 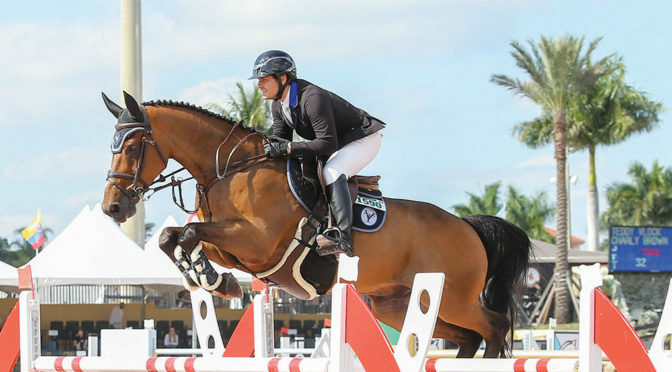 With Vlock Show Stables, based in Wellington, the young athlete devotes half of his week to competing in Florida, and commutes to spend the other half at college in Connecticut. A psychology major, Vlock is in his sophomore year at Yale and has learned how to balance studying for his classes while also maintaining a full show schedule every winter in Wellington. While many top competitors have been training since childhood, Vlock began riding at the age of 13 thanks to a summer camp that offered equestrian activities as a part of its program. As the summer camp drew to an end, Vlock’s interest in horses was just beginning. That initial intrigue has developed into more than just an enjoyable pastime. Vlock now competes regularly in FEI classes around the world with some of his current top horses, including Charly Brown, Gaspar Van Den Doorn and Cristobar, a horse that took Vlock from the 1.20m jumpers to international competition at the 1.50m height. Vlock began his competitive career in the junior hunters. With the help of an exceptionally special horse, Grey Street, the pair dominated the junior hunter division in 2016, collecting championship honors during the WEF circuit and the prestigious Devon Horse Show in Pennsylvania, finishing the year with a championship win at the historic National Horse Show in Kentucky. Thanks to the team at Vlock Show Stables, in addition to one of his trainers, Irish show jumper Darragh Kenny of Oakland Stables, Vlock’s transition from the hunter ring to the jumpers was seamless. Working with Kenny, currently ranked 20th in the world, has proven to be a vital part of Vlock’s progression. “Teddy has progressed very nicely in the past few years. He has a great team behind him helping to work toward his goals. We made a plan that we all believe in, and Teddy has worked very hard to be more competitive at the higher levels,” Kenny said. Kenny and Vlock have now worked together for three years, and Vlock credits much of his success to the Irish athlete, along with his entire team at Vlock Show Stables, including his other trainer Stephen Moore. While both are based in Wellington during the winter season, the two have formed a dynamic training relationship that works throughout the remainder of year, often while Kenny is campaigning throughout Europe for his own competition schedule. “When Darragh isn’t here, he always watches all of my rounds, wherever they are, and then calls me after the class so we can talk about it,” Vlock said. As the equestrian season ends in Wellington, Vlock is looking toward preparing for traveling North America and Europe with his team. His competition schedule will take him to Lexington, Kentucky and Calgary in Canada, as well as Europe to compete in various legs of the Longines Global Champions Tour, where the young rider is a member of the Scandinavian Vikings team. All the while, Vlock will continue studying at Yale and balancing management of T&R Developments, an elite equestrian, residential and restaurant property business.